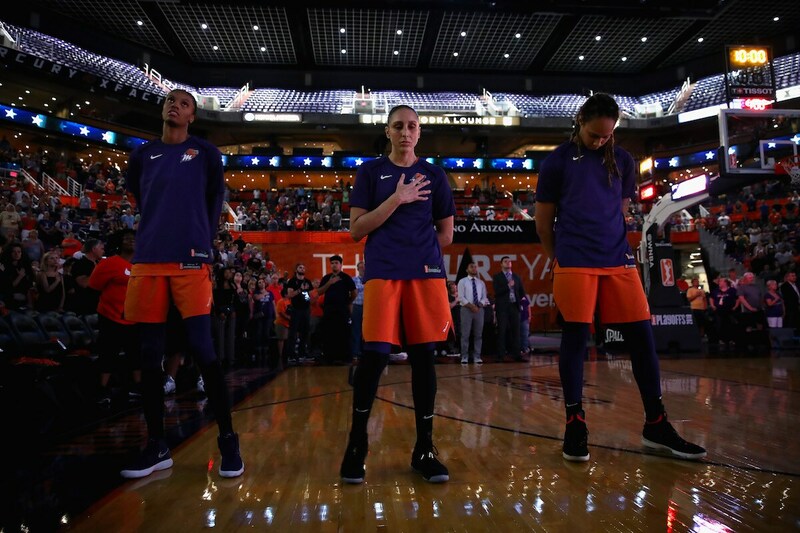 PHOENIX, AZ - AUGUST 31: (L-R) DeWanna Bonner #24, Diana Taurasi #3 and Brittney Griner #42 of the Phoenix Mercury stand attended for the national anthem before game three of the WNBA Western Conference Finals against the Seattle Storm at Talking Stick Resort Arena on August 31, 2018 in Phoenix, Arizona. 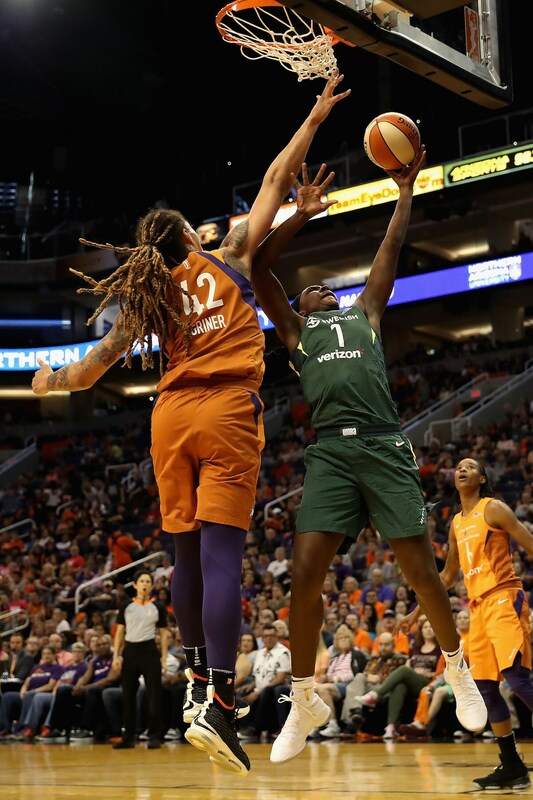 PHOENIX, AZ - AUGUST 31: Natasha Howard #6 of the Seattle Storm and Brittney Griner #42 of the Phoenix Mercury battles for position during Game Three of the WNBA Semifinals on August 31, 2018 at Talking Stick Resort Arena in Phoenix, Arizona. PHOENIX, AZ - AUGUST 31: Briann January #12 of the Phoenix Mercury handles the ball against the Seattle Storm during Game Three of the WNBA Semifinals on August 31, 2018 at Talking Stick Resort Arena in Phoenix, Arizona. 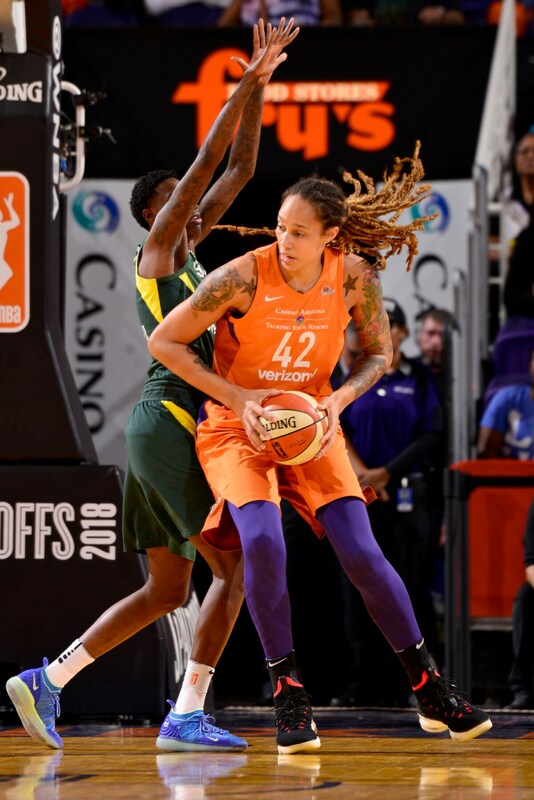 PHOENIX, AZ - AUGUST 31: Brittney Griner #42 of the Phoenix Mercury handles the ball against the Seattle Storm during Game Three of the WNBA Semifinals on August 31, 2018 at Talking Stick Resort Arena in Phoenix, Arizona. 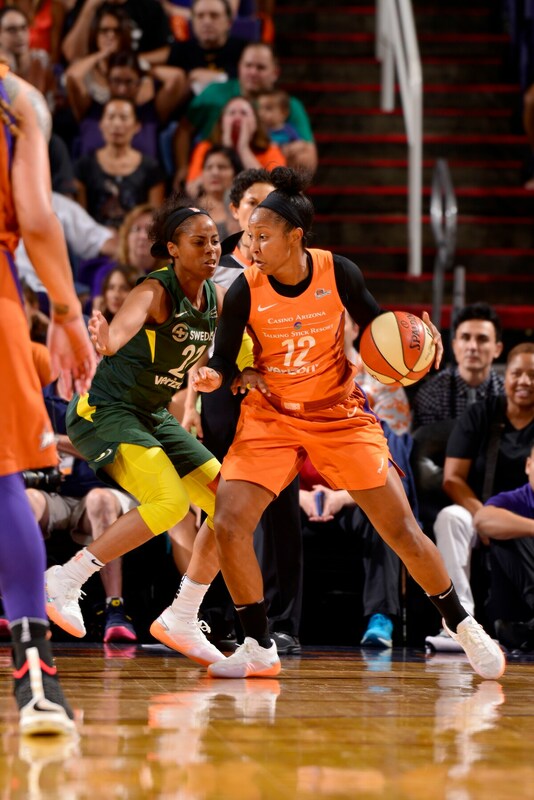 PHOENIX, AZ - AUGUST 31: DeWanna Bonner #24 of the Phoenix Mercury handles the ball against the Seattle Storm during Game Three of the WNBA Semifinals on August 31, 2018 at Talking Stick Resort Arena in Phoenix, Arizona. 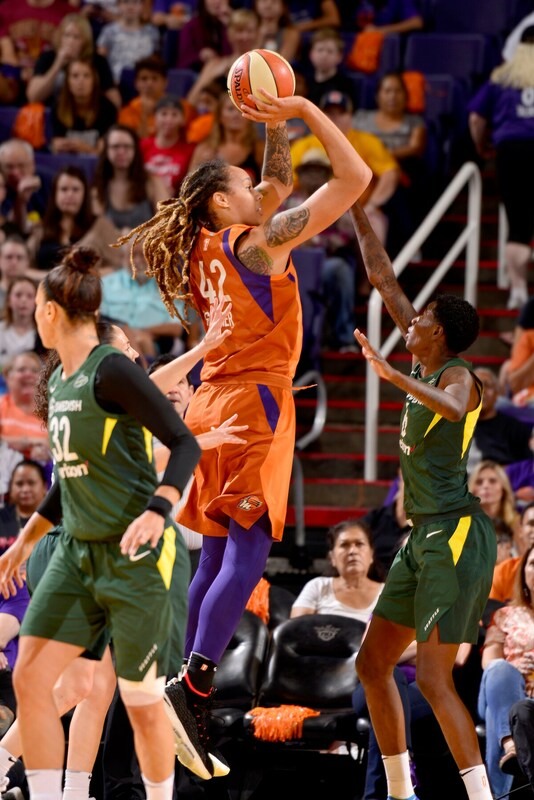 PHOENIX, AZ - AUGUST 31: Brittney Griner #42 of the Phoenix Mercury shoots the ball against the Seattle Storm during Game Three of the WNBA Semifinals on August 31, 2018 at Talking Stick Resort Arena in Phoenix, Arizona. 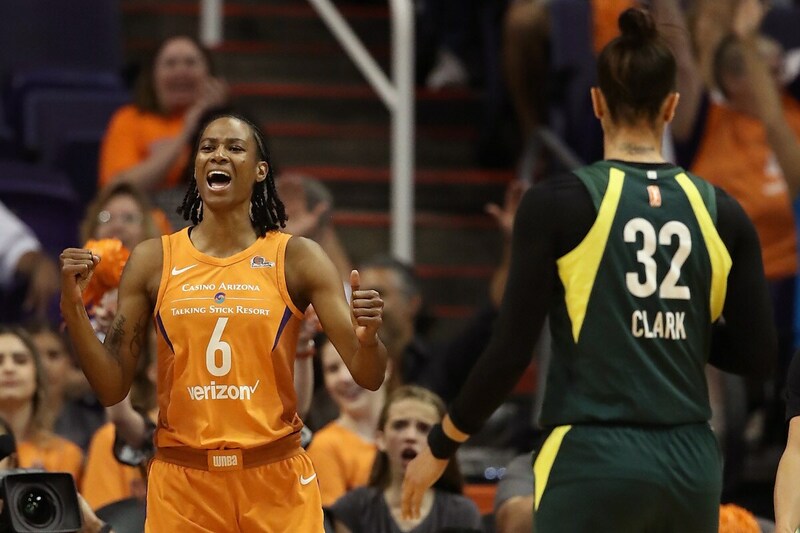 PHOENIX, AZ - AUGUST 31: Yvonne Turner #6 of the Phoenix Mercury reacts after scoring ahead of Alysha Clark #32 of the Seattle Storm during game three of the WNBA Western Conference Finals at Talking Stick Resort Arena on August 31, 2018 in Phoenix, Arizona. 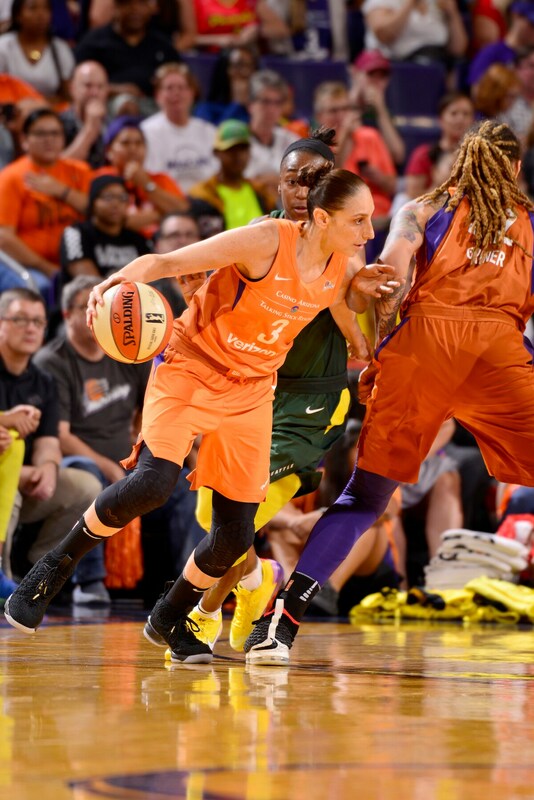 PHOENIX, AZ - AUGUST 31: Diana Taurasi #3 of the Phoenix Mercury handles the ball against the Seattle Storm during Game Three of the WNBA Semifinals on August 31, 2018 at Talking Stick Resort Arena in Phoenix, Arizona. 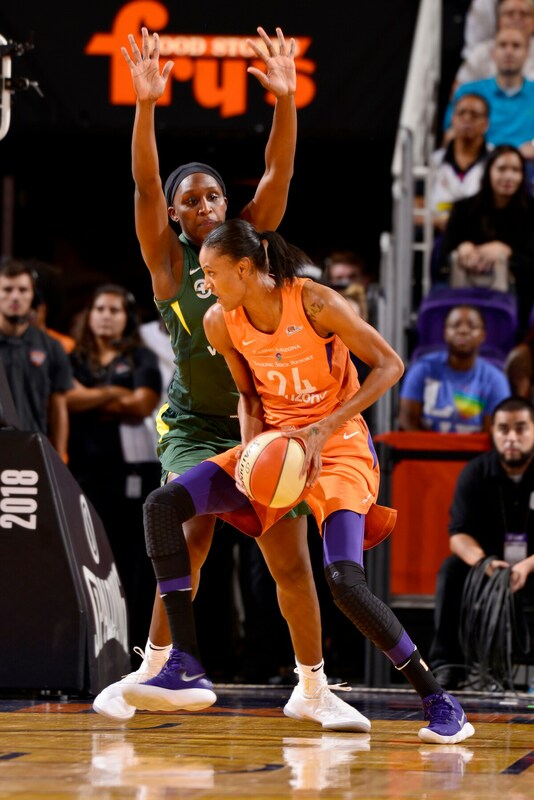 PHOENIX, AZ - AUGUST 31: Crystal Langhorne #1 of the Seattle Storm attempts a shot against Brittney Griner #42 of the Phoenix Mercury during game three of the WNBA Western Conference Finals at Talking Stick Resort Arena on August 31, 2018 in Phoenix, Arizona. 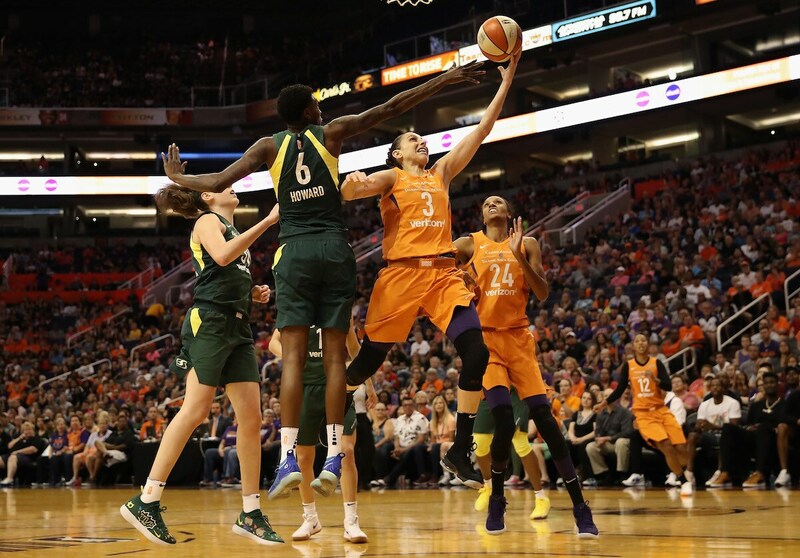 PHOENIX, AZ - AUGUST 31: Diana Taurasi #3 of the Phoenix Mercury lays up a shot past Natasha Howard #6 of the Seattle Storm during game three of the WNBA Western Conference Finals at Talking Stick Resort Arena on August 31, 2018 in Phoenix, Arizona. The Mercury defeated the Storm 86-66. 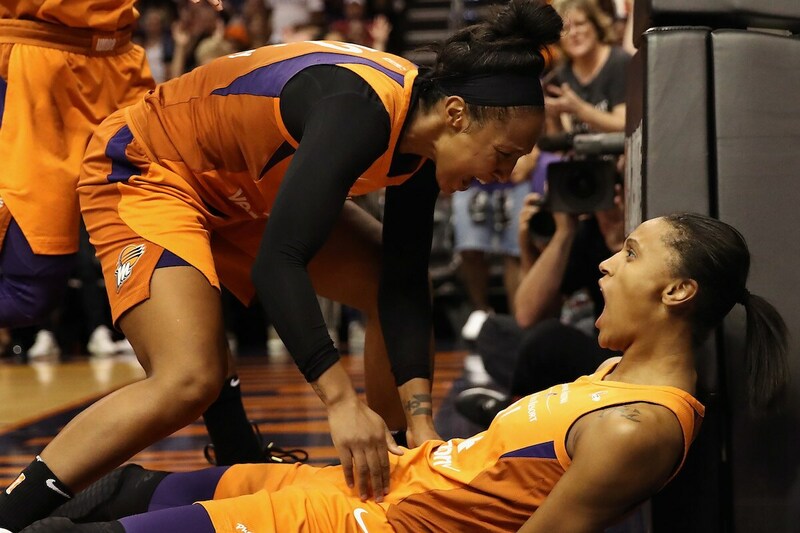 PHOENIX, AZ - AUGUST 31: DeWanna Bonner #24 (R) of the Phoenix Mercury celebrates with Briann January #12 after scoring against the Seattle Storm during game three of the WNBA Western Conference Finals at Talking Stick Resort Arena on August 31, 2018 in Phoenix, Arizona. The Mercury defeated the Storm 86-66. 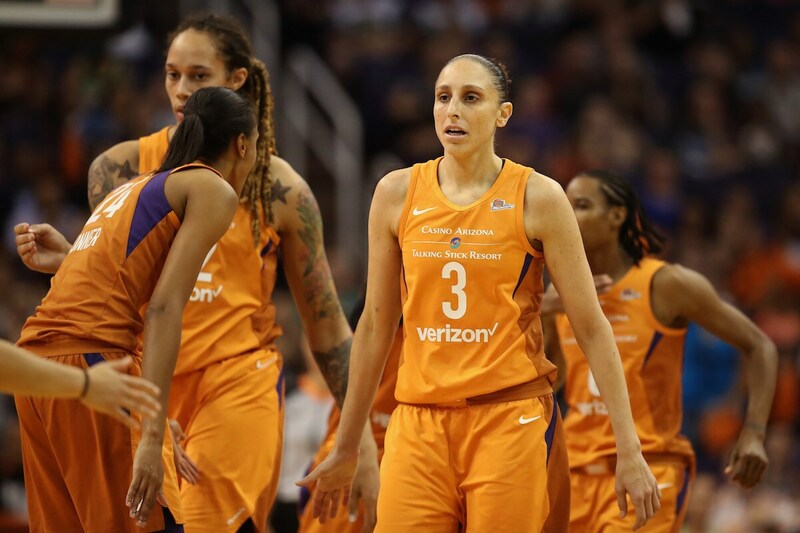 PHOENIX, AZ - AUGUST 31: Diana Taurasi #3 of the Phoenix Mercury high fives DeWanna Bonner #24 during game three of the WNBA Western Conference Finals against the Seattle Storm at Talking Stick Resort Arena on August 31, 2018 in Phoenix, Arizona. 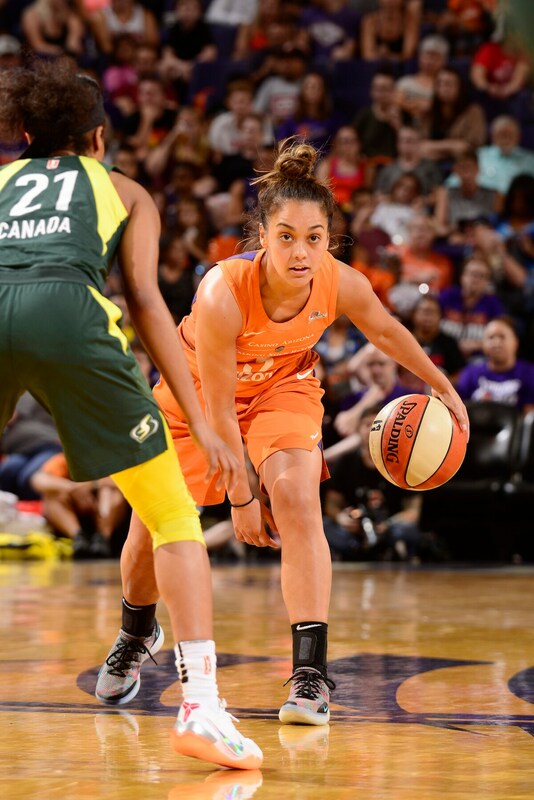 The Mercury defeated the Storm 86-66. 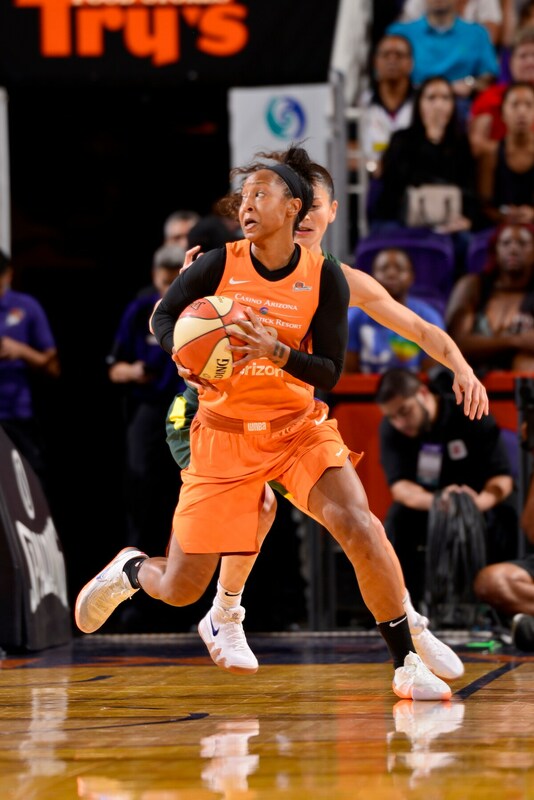 PHOENIX, AZ - AUGUST 31: Leilani Mitchell #5 of the Phoenix Mercury handles the ball against the Seattle Storm during Game Three of the WNBA Semifinals on August 31, 2018 at Talking Stick Resort Arena in Phoenix, Arizona. 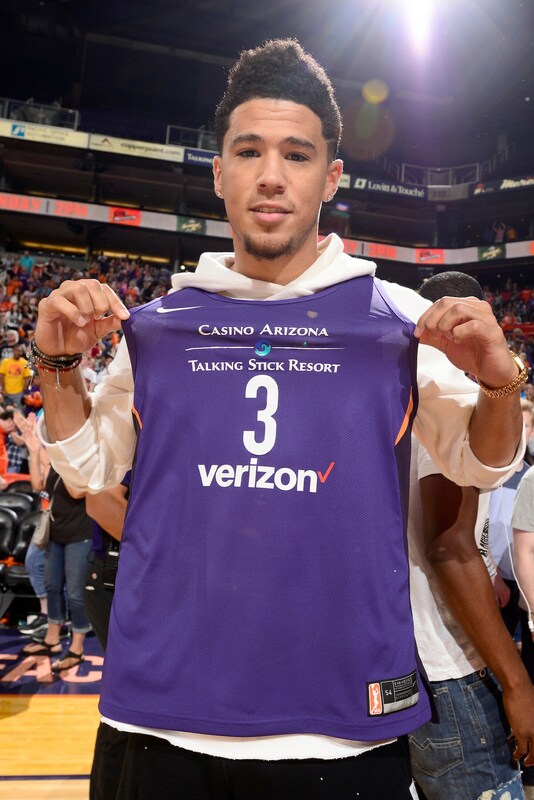 PHOENIX, AZ - AUGUST 31: Devin Booker #1 of the Phoenix Suns attends the game between the Seattle Storm and the Phoenix Mercury during Game Three of the WNBA Semifinals on August 31, 2018 at Talking Stick Resort Arena in Phoenix, Arizona.